Move the slider to compare photographs. Looking north up Congo. View larger here. Look at other comparison photographs here. More example of advertising for the Sunnyside district in San Francisco newspapers in the first years, 1891-1892. Also see this post. SF Examiner, 27 Aug 1891. Note the frequent use of white space, clean-looking typefaces, and asymmetrically positioned text blocks, a bit ahead of their time–favorite features of midcentury advertisers decades later. SF Examiner, 30 Aug 1891. SF Call, 7 Jun 1891. In the 1880s and 1890s, a reclusive man named Nelson Shoots dug deep mine shafts in search of gold in the rocky hills a half-mile west of Sunnyside, in Sutro’s forest of eucalyptus trees. He worked his claim for over seventeen years, the public learned, when his exploits came to light as he lay on his deathbed in the spring of 1898. 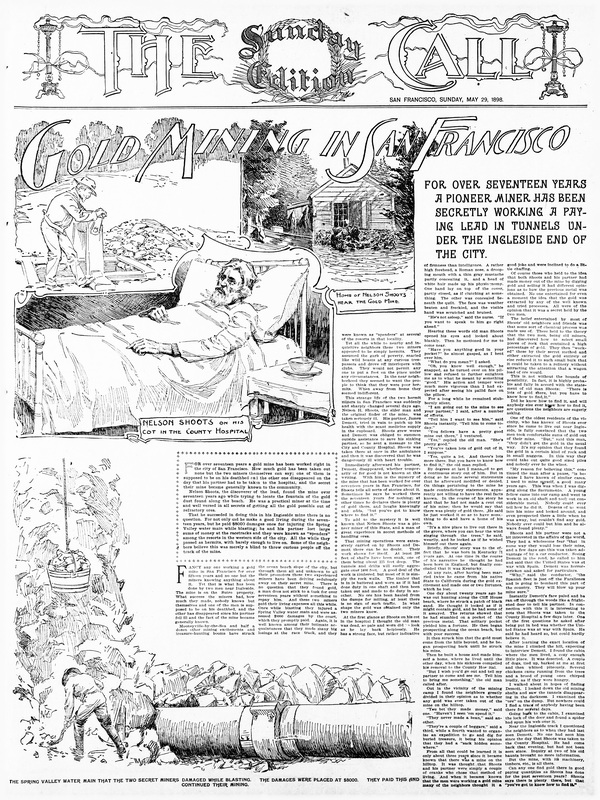 The San Francisco Call devoted a whole page to the story, complete with illustrations. SF Call, 29 May 1898. Read article here or download an image of article here. On Monterey Boulevard in Sunnyside, there are two unique 3-unit buildings that were designed in 1963 by architect Jonathan Bulkley. Perhaps you have walked by and wondered about the history behind them. Today they stand somewhat altered from their original look. The San Francisco Examiner featured them shortly after their construction. They have unusual triple barrel-vaulted tops and two levels of balconies on the front. SF Examiner, 3 Nov 1963. Feature: 420-422 Monterey Blvd. Vaulting over entrances is missing from drawing. At the edge of Sutro’s forest of eucalyptus trees, in the northwest corner of Sunnyside, the 600 block of Mangels Avenue was home to several families who enjoyed a truly rural existence in the early years. Recently some photos were graciously loaned to me to scan, so there is some visual record of life there. The photos are from the personal archive of resident Geoff Follin, sent to him in 1987 by a man who grew up on the block during these years—Lawrence Behler (1908-1999). Behler included a brief letter of explanation. 1917. Bertha, Charles, and Arnold Behler. 663 Mangels Ave. Photo courtesy Geoff Follin. 1917. Lawrence Behler with his mother Bertha. 663 Mangels Ave. Photo courtesy Geoff Follin. 1917. 663 Mangels Ave. Lawrence’s brother Arnold Behler on steps. Photo courtesy Geoff Follin. 12 Jan 1987. Letter from Lawrence Behler to resident of 663 Mangels Ave. Courtesy Geoff Follin. This weekend Glen Park Neighborhoods History Project will be at the Old Mint for History Days 2019. This event brings together eighty exhibitors, local history groups and related stuff, actors in costumes, talks — the year’s premier event for anyone who interested in local history and good stories. Read more https://sfhistorydays.org/ Hope to see you there. On Tuesday 29 January 2019, at the meeting of the San Francisco History Association, Glen Park Neighborhoods History Project reprised our blended presentation ‘America’s First Suffrage March & the Glen Park Women Behind It,’ which traces the women of Glen Park who were instrumental in the first suffrage march in the United States. After Evelyn Rose’s talk about the background of the event and the women’s involvement with this under-documented historic event, the evening concluded with the short play ‘Raise Your Gladsome Voices,’ written by Amy O’Hair and performed by Valerie Fachman and Haley Roth-Brown, and introducing Christine Konkol. Taking bows. ‘Raise Your Gladsome Voices’ playwright Amy O’Hair (far left) with actors (left to right) Valerie Fachman, Haley Roth-Brown, and Christine Konkol. Photo: Josephine Coffey. ‘My husband Theodore Pinther is not so keen on that.’ Photo: Sharon Nadeau. Move slider to compare photographs. View larger here. Look at other comparison photographs here. Move slider to compare photographs. Looking south from Hazelwood Ave in Sherwood Forest neighborhood on Mount Davidson. Changes at the Balboa Reservoir (center) are notable, while much else remains the same. San Bruno Mountains on horizon. View larger here. Look at other comparison photographs here.